Will J.J. Abrams Use Time Travel in Star Wars 9 to Fix The Last Jedi? Will director J.J. Abrams pull a little time travel magic in Star Wars 9 to fix some of the perceived flaws in The Last Jedi? It's possible, now that time travel has entered the official Star Wars canon thanks to the latest episodes of Star Wars Rebels that aired this past week. There has to be something more to it than what we've seen thus far. Will it be used in the next big screen sequel? Or perhaps one of the two new trilogies coming from director Rian Johnson and the Game of Thrones guys? It appears the sky may be the limit. With The Last Jedi heading to its inevitable home on VOD and Blu-ray, many fans are still mad about what the movie did to the franchise. So much so, that during its initial theatrical run (which hasn't lasted as long as Jumanji: Welcome to the Jungle or The Greatest Showman), a petition was launched to scrub The Last Jedi from the official canon. 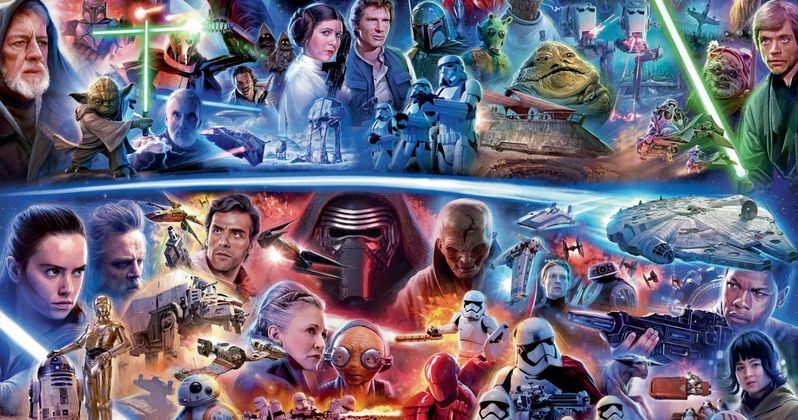 Now, with Time Travel an official part of Star Wars lore, including all upcoming movies, TV shows, and books, some fans are seeing this as the perfect opportunity for Abrams to go back and fix some of the perceived ideas that fans believed the latest sequel got so wrong. The idea of time travel is not new in the Star Wars universe, but Star Wars Rebels is the first time it has been introduced as official canon. Some believe that Luke's training on Dagobah in The Empire Strikes Back was a function of time bending, as Luke appears to be training for a lot longer than Han, Leia, Chewbacca and C-3PO are stuck on that astroid and the time they spend in Bespin. But that hasn't fully been explored in any of the books as of yet to make the idea a reality. Recent books have explored the idea of a Force Nexus, which provides an abnormal concentration of Force energy. And it can result in time discrepancies. Some believe this is why Luke was able to train for as long as he did. In Star Wars: The Clone Wars, Obi-Wan, Anakin, and Ahsoka discover the powerful time conduit Mortis. It made it appear as though the Jedi spent several days there, though to everyone else, it was just a matter of seconds. Here, we have time travel slowly being introduced into the official canon. But Rebels takes it even further. Now, it is confirmed that individuals in the Star Wars universe can directly affect events in different time periods. Ezra discovers a World Between Worlds as he makes his way through a portal at the Lothal Jedi Temple. It is a place that stands outside of time and space. As he enters, he hears voices from across the entire spectrum of the Star Wars universe. In the show, we hear voices from all sorts of familiar characters, including future characters such as Rey and Kylo Ren along with those from the past. Inside the portal, Ezra witnesses the climactic duel between Darth Vader and Ahsoka. Ezra is able to pull Ashoka out and into his timeline. This goes beyond mere time bending or manipulation. It means that anyone entering this portal could reach back in and save Han Solo from being killed by Kylo Ren, or stop Luke Skywalker from Force projecting himself during the climactic fight in The Last Jedi. Though it must be noted, Ezra does seal away the time portal on Lothal. Empire Palpatine, who is in this episode, never learns how to access it. This new time travel function doesn't really change the Force or our understanding of how it's used. But it is a new idea we haven't seen in the official canon before. And that portal is still there, waiting to be rediscovered by someone, anyone, who is a powerful force user, such as Rey, who could go back and redo any and all things important enough. She is, after-all, heard in this scene during Rebels. There must be a bigger plan for the time portal on Lothal, otherwise why introduce it into the canon? Ahsoka eventually ends up back where she began and her fate is still the same. So did Ezra merely fix a time loop? Or will there be an as-yet seen ripple effect? As Yoda has stated in the past,"always in motion is the future." So, it is definitely there at his disposal. If he felt so inclined, J.J. Abrams could utilize time travel to fix some of the conceived wrongs presented in The Last Jedi, but that doesn't mean that stuff didn't still happen. It will be interesting to see how this is used moving forward. It would be cool to see Han and Luke together again on the big screen, but using time travel to do it seems almost like a cheat. Seriously, if a Jedi was so inclined at this point, they could possibly go back and stop C-3PO and R2D2 from climbing aboard that shuttle, stopping them from reaching Tatooine, which would undo everything we've seen in A New Hope and the sequels that follow. Would Disney and Lucasfilm really allow that to happen? Who knows? As it stands, time travel was introduced in the latest episode of Disney's Star Wars Rebels and it's here to stay. Take that Force projection!